Our luxurious rooms offer the business traveller desk space and Wi-Fi. There’s something stately about a business meeting in an 18th-century country house surrounded by park- and woodland. This former home to the Earl of Bristol provides the ideal backdrop for your event or meeting, with spectacular views of the National Trust parkland in which the hotel is set. All of our rooms around the hotel are unique, from the impressive Chinese Room with its original hand-painted wallpaper, to the bright, wood-panelled Boardroom. We have a large selection of packages on offer, but we can always organise custom meetings and conferences to suit your needs. We can arrange activities for team-building events, or create bespoke menus for a business dinner. If you’re looking for something different to the norm, our Events Manager is full of ideas for making your event stand out from the rest. There is disabled parking at the hotel, and all of our rooms can be accessed via lifts. If you have any specific access requirements, please do let us know in advance. For a half-day, full-day or overnight event, choose from one of our packages. You can find details of our packages, delegate rates and room capacities here. If you’re interested in working lunches, working breakfasts, exclusive hire and hourly rates, we can provide you with quotes on request. 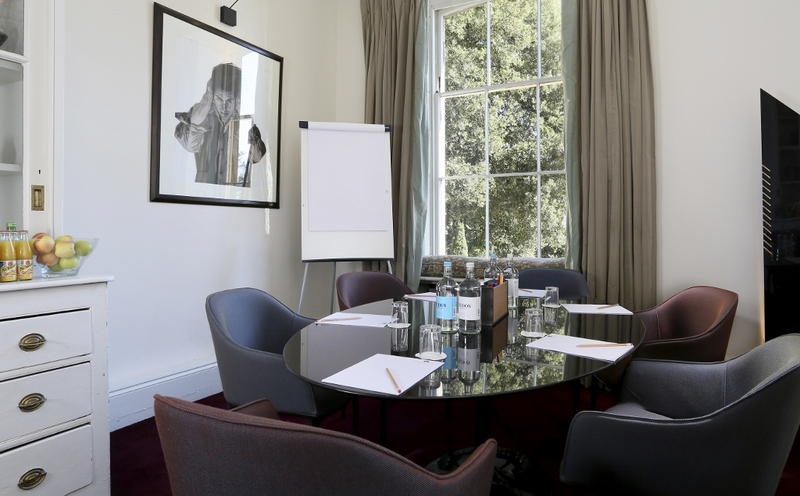 Perfect for smaller meetings and interview days, the Study holds up to six people and overlooks the Ickworth woodland. If you need to impress an important client the Chinese Room will serve you well, offering private dining for up to ten people. The 18th-century hand-painted wallpaper lends the room a grand atmosphere. To protect the paper from light bleaching, the curtains need to be closed at all times, so this room is best suited to evening dinners in the darker months. Overlooking the Italianate gardens, Frederick’s is perfect for meetings or business dinners of up to 18 people. The luxurious high ceilings give the room a sense of openness and space, allowing you to relax and focus. Overlooking the woodland, this stunning wood-panelled room has a large vintage oak boardroom table. Anywhere from four to 22 people can sit together at the table, while the room can accommodate up to 35 when arranged theatre-style for a business presentation or seminar. Located on the lower ground floor in the original kitchen of the house, this room is open and versatile, holding 50 in a theatre setup or 26 as a boardroom. With its own ceiling-mounted LCD projector, drop-down screen and surround sound, the Old Kitchen is great for creative workshops and presentations alike. Choose from a traditional furniture setup for formal meetings, or opt for comfy chairs and beanbags for creative workshops and team-building days. We can even throw in some popcorn if you so choose. This bright and airy room at The Lodge overlooks its own private gardens. For relaxed meetings tucked away from the main hotel, we can tailor our packages to your requirements. Team it with the apartments to create a fully self-contained venue, perfect for conferences that run over multiple days. If you’re interested in hiring The Ickworth or one of our rooms, get in touch on 01284 735350 or email events@ickworthhotel.co.uk.